﻿The Riverside Conference Center is situated at the Pride Park Retail Center on the outskirts of Derby City Center. Built to hold between 800-1000 people, it is the perfect size for our conventions. 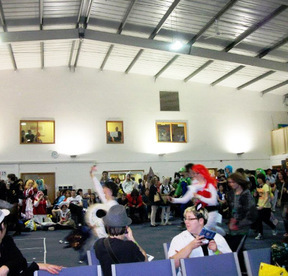 It has a large main hall, a smaller side hall, as well as 3 other panel rooms. The building includes a food hatch that serves tea, coffee, cold drinks (non-alcoholic), snacks and chips. It also includes upstairs & downstairs toilets, a free water cooler and even a stair-lift! St. John's Ambulance will be on hand on the Saturday of the convention. We take your safety very seriously and hope this brings piece of mind if you are bringing family, friends or have any health worries that may be of concern.